“Congratulations!” It’s a word that elicits joy and even disbelief. Dartmouth said this to you in December or March, and now it feels like September cannot come soon enough. To hold you over until then, I wanted to share my experience as a first-year student before my first year ends. I spent the days, weeks and months before coming to Dartmouth feeling validated. The burden of working to get into college, especially a college as prestigious as Dartmouth, all while struggling against the oppression I faced because of my identity as a first-generation, low-income Latina, began to fade. The sacrifices, discrimination and rejection that society directed my way had finally failed. I got in. My parents fell into that trap, too. That word — congratulations — had just as much power over them as it did over me. My dad would show my picture to his friends at work as he packaged newspapers to deliver from midnight until dawn. My mom would tell her immigration lawyer about me in the midst of hearings and deportation anxiety. And yet, it was all worth it for us. I got in. 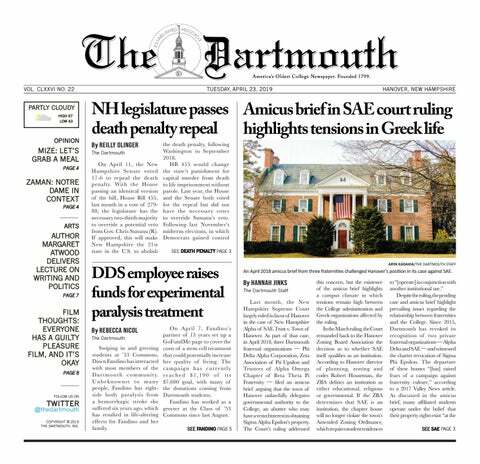 I felt excited about the new space of stability and acceptance that I thought Dartmouth would provide me. After all, the College was welcoming me home. I felt reassured by the impressive diversity statistics. I felt protective about Dartmouth because I thought that, in admitting me, my identities and beliefs would be protected as valuable to the school in return. It wasn’t long until I felt betrayed. My expectations of my Dartmouth experience were frankly unrealistic. I am often the only minority in my classes, and I know that my presence challenges the complacency that normally exists on predominantly-white campuses. The inequities of public education are exacerbated behind these private doors. My classmates debate affirmative action and immigration while looking at me anxiously for validation or disapproval. My visibility on campus exposes me to prejudices about minorities, and I am expected to prove those very stereotypes wrong, too. Working to get admitted to Dartmouth was hard. Being here has been even harder. But I did not make the wrong choice by coming. My experiences at Dartmouth have made it clear that I have a moral obligation to fight against the inequalities in which the College is complicit. This is not just a squabble or quarrel. This is an overdue confrontation with an institution originally built with the intent of assimilating indigenous peoples and a subsequent history of injustice. It’s not something that you really have to think about unless it affects you, but I want to make it clear to all of you that I and the Class of 2022 cannot fight alone. I don’t want to exonerate Dartmouth from its actions, but I’ll admit: I’m not the same person I was seven months ago. Dartmouth has introduced me to friends and mentors who genuinely believe in me and my desire to change the College as much as I can in these four years. I know so many activists on campus who don’t want celebrity or fame — they just want to make a difference. Dartmouth is unique because people here really are voices crying out in the wilderness, and they make sure to bring you along too. My only hope is that next year you’ll join me.